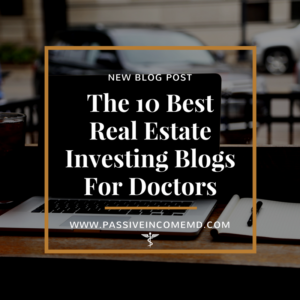 The 10 Best Real Estate Investing Blogs for Doctors | Passive Income M.D. I became interested in real estate investing sometime during my anesthesia residency and have been hungry for knowledge on the topic ever since. I’ve read book after book, like Rich Dad, Poor Dad and The ABC’s of Real Estate Investing, and I spend a good amount of time on a weekly basis educating myself online. With this in mind, I wanted to highlight some blogs that give information on buy and hold type strategies or more passive-type strategies. These strategies should produce passive income for long-term financial security and wealth creation on the way to financial freedom. While I love watching HGTV, house flipping and syndicating apartment buildings are more active pursuits and probably best handled by full-time real estate investors in my opinion. So without further ado, here is my list of The 10 Best Real Estate Investing Blogs for Doctors. 1. The BiggerPockets Blog – This is the granddaddy of real estate investing blogs. The blog and the forum put together is the most comprehensive resource out there on the web for the amateur or professional investor. Check out this post: Why a 30-Year (NOT 15-Year) Mortgage Gives You a Better Shot at Building Wealth. 2. REtipster – “Real World Guidance for the Part-time Investor.” Wait, that speaks to me and probably most other professionals out there. Seth Williams’ posts are a wealth of information but very easy to understand and to take action on. Check out this post: The Beginner’s Guide to Buying Rental Properties (A Case Study). 3. Just Ask Ben – Ben Leybovich is a straight shooter who had to change careers due to a medical condition and built up a 1.5m portfolio in a short amount of time. He says he’s passionate about educating and it shows in his writing. Check out this post: The 7 Reasons to Invest in Real Estate Instead of Stocks. 4. Morris Invest – Clayton Morris and his wife Natali (www.natalimorris.com) believe in the long term buy and hold strategy in real estate for long term wealth creation. They’ve created a nice multimedia platform and I really enjoy the content they put out. I love to hear how this couple works together to try to achieve financial freedom through passive income. (Sound familiar?) Check out this post: The BRRRR Method for Real Estate Investing. 5. HomeUnion Blog – This blog, by the company HomeUnion (a sponsor of this site), gives actionable tips for people interested in building a portfolio, one single family residence at a time. Their infographics are on point. Check out this post: 5 Options for Financing Rental Property Investments. 6 . Real Estate in Your Twenties – Brandon Turner is one of the voices you hear on the Biggerpockets podcast, one of my favorite podcasts. This is his personal blog where he shares his strategies for creating wealth through real estate, even without much capital and at an early age. Check out this post: How I Used Real Estate to Pay for my newborn Daughters College Education. 7. Memphis Invest Blog – Chris Clothier runs this blog and is the face of the company, Memphis Invest, a business that helps people invest in turnkey real estate. I enjoy reading the blog because it speaks to the investor looking to build a steady stream of passive income and wealth over time. Check out this post: Building a Real Estate Investing Strategy: Minimize Risk in Your Investments. 8. Coach Carson – Coach Carson has a talent for explaining real estate investing in a very practical way and it’s quite easy to follow. Spend some time on this site and you can’t help but walk away having learned something. His goal is to help you build wealth and “do more of what matters in your life.” Hey sounds like we’re kindred spirit. Check out this post: The Debt Snowball Plan – How to Get Free & Clear Rental Properties. 9. Afford Anything – Paula Pant is a writer and blogger who achieved financial freedom through rental properties at a young age. She’s an avid traveler and a fantastic writer. Her goal was to develop sustainable, long-term freedom and she decided to do that through real estate. For those who think that rental real estate is too much work, see how she manages it with all of her travel and other life activities. Check out this post: Real Estate Investment Report: How I Earned $5,604 in Five Hours. 10. Financial Samurai – Sam Dogen is one of my favorite financial bloggers and he’s amassed a very enviable passive income stream. A good portion of it comes from real estate. 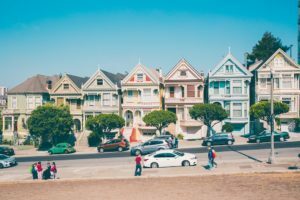 He’s benefitted from buying in the booming San Francisco area and has smartly positioned his properties to provide increasing revenue year after year. Check out this post: Real Estate: My Favorite Investment Asset Class To Build Wealth. What are your favorite real estate investing blogs? Am I missing any? Thanks for the mention! I haven’t heard of a couple of the sites you’ve mentioned so it’ll be fun to check them out. I can’t believe Coach Carson has like 80 rentals! My mind would explode. I’m going to be taking profits on one property I got into contract at the end of 2004 to simplify life and diversify away from SF. Thanks for sharing your experience with everyone. Been inspirational for me. Geographically diversifying is a great idea. I’m also not afraid to diversify in type of RE investing: single family, multifamily, crowdfunding, syndications, etc. I haven’t yet diversified my own real estate holdings geographically, but it’s a good idea to start working on. It’s been interesting to watch your own real estate journey, Sam. At $40,000/unit you could probably buy 30-40 units in my college town for the price of the house you just sold in San Francisco. That would be diversification but perhaps not simplicity:) Amazing how prices vary in the same country. It’s only $40,000 a unit? That is nuts! Valuation differential is huge, which is why I plan on selling one unit and diversifying out of San Francisco. I want to put more money into the heartland of America. I’ve started investing in the Midwest and yeah, totally different financials. Makes a lot of sense. I’m a big fan of the Biggerpockets blog, podcast, forums, books, etc. There is a wealth of information on that site and it’s a great resource for those trying to get into real estate investing without the hype. I once went to a real estate seminar and it hyped up buying and flipping properties but ultimately was trying to sell you on paying for a 3 day course. It wasn’t that expensive but apparently at that 3 day course, they were selling you on their mentorship or something like that for big bucks. The info on BP is transparent and honest. I’m also a big fan of Afford Anything and like how she goes into details about what she’s doing, especially with coordinating the renovation. Can’t wait for her course to come out. Most of those courses are free or at minimal cost to draw you in. It’s kinda like those timeshare offers. As long as you can go, enjoy it for what it is but don’t get sucked in, you can get something out of it. Thank you for including me on your list! It’s an honor. My mother is a dentist and my father has invested in real estate for many years. So, I am very familiar with the medical-real estate investing connection. It’s a combination that can work very well. You’re welcome. I’m banking on the combination working well! Thank you for including BiggerPockets in your list! Looks like you’ve learned a few things in the last several years! Nice site. Thanks! I used to play a bit myself. Thanks for the list. Some of those are new to me. Yeah. Seems like over the past year there have been quite a bit of doctors making their mark online. Nothing wrong with diversifying. Sometimes I wonder whether it’d be worthwhile to invest in real estate (rather than REITs) to diversify. Much of my trouble is just carving out time to educate myself in real estate. Still have to figure out how the revenue stream real estate would work out for me. REITs are fine but I think you miss out on the true potential of owning your own real estate. REITs are known to correlate with the market so I actually don’t consider them true diversification. Thanks for this great Article…. Great list, thanks for putting it together. I follow a lot of these as well. Real Estate is truly outstanding and most effortless approaches to fence a speculation portfolio against expansion. Land is the main resource that responds proportionately to expansion. Success depends a lot on if you know people in your area who would use you for their business and what firm you start off with and what forums and blogs you have been involved with. Great list of real estate investing blogs. These blogs are so much informative. Thanks for sharing.